It’s been a big year for Kruse Village. In January, we were honored to be selected as Brenham’s only skilled nursing and rehabilitation provider to be included in the prestigious Baylor Scott & White Quality Alliance. Next, we received Medicare’s Five-Star Rating – the highest rating possible – awarded to the nation’s best nursing homes. Again, Kruse Village was Brenham’s only recipient of this esteemed designation. At Kruse Village, nothing is more important than the health and quality of life of our residents. We exclusively hire team members who have a heart for serving seniors. We strive to continually improve our activities, services, advanced healthcare, facilities and much more. 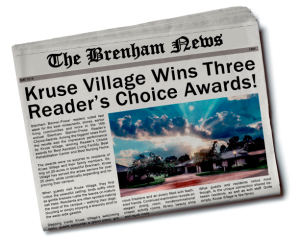 We’re thankful for these latest accolades and encourage you to see Kruse Village for yourself and receive a Free Senior Living Assessment – just call Rachael or Coy at 979-830-1996.